一种滑动机构，用于连接第一部件与第二部件使第二部件在盖合于第一部件上的第一状态及伸出第一部件的第二状态之间切换。 A sliding mechanism for connecting a first member and a second member of the second switch between the second member engaged with the first cover state to the first state of the first member and the extension member. 滑动机构包括第一旋转件、第一卡扣件、第二卡扣件以及第一弹性件。 The slide mechanism includes a first rotary member, a first locking component, a second locking component and the first elastic member. 第一旋转件相对两端分别转动连接于第一部件与第二部件上。 A first rotary member are rotatably connected at opposite ends to the first member and the second member. 第一弹性件设置于第一旋转件与第一部件之间。 A first elastic member disposed between the first rotary member and the first member. 第一卡扣件与第二卡扣件分别设置于第一部件与第二部件上，且二者可在外力作用下卡合与分离。 The first locking component and the second locking component are disposed on the first member and the second member, and both may be engaged and separated by an external force. 当第一卡扣件与第二卡扣件卡合时，第一部件与第二部件扣合，第二部件挤压第一旋转件使第一弹性件发生弹性形变。 When the first locking component is engaged with the second locking component, the first engaging member and the second member, the second member of the first rotary member pressing the first elastic member is elastically deformed. 当第一卡扣件与第二卡扣件分离时，第一弹性件恢复弹性形变以驱动第一旋转件相对第一部件转动。 When the first locking component and the locking component of the second separation, the first elastic member elastically deformed to restore a first rotary drive member relative to the first rotatable member. 此外，还提供一种带有该滑动机构的装置。 In addition, also provides an apparatus having the sliding mechanism. 本发明涉及一种滑动机构，特别涉及一种带有该滑动机构的装置。  The present invention relates to a sliding mechanism, in particular to a device having the sliding mechanism. 近年来移动电话快速普及，在各种场合中愈来愈可见到人手一机的现象。  In recent years, the rapid spread of mobile phones, more and more phenomena can be seen to have one of a variety of occasions. 为应不同消费者的需求，移动电话不但功能不断地扩充，且外型也出现多种不同的形式供消费者选择，如直板式、滑盖式或掀盖式等。 To be different consumers, the mobile phone will not only continue to expand functionality and appearance also appeared in many different forms for consumers to choose, such as candy bar, clamshell or slide-out and so on. 其中滑盖式移动电话由于具有体积小以及大屏幕等特点，使得滑盖式移动电话受到众多消费者的青睐。 Since the slide type mobile phone which has the characteristics of small size and large-screen, so that the slide type mobile phone by many consumers. 但是，目前市面上常见的滑盖式移动电话大部分需要使用者手动将滑盖推至滑开位置，这样将会降低移动电话操作的方便性。 However, the current common market slide type mobile phone users most need to manually push the slide to slide open position, this will reduce the convenience of mobile phone operation. 有鉴于此，有必要提供一种操作简单、方便的滑动机构。  In view of this, there is a need for a simple, easy sliding mechanism. 还有必要提供一种带有该滑动机构的装置。  There is needed is a device having the sliding mechanism. -种滑动机构，用于连接第一部件与第二部件使所述第二部件可在盖合于第一部件上的第一状态及伸出第一部件的第二状态之间切换。  - type of sliding mechanism, for connecting a first member and a second member of the second member may be switched between the second state to the first state of the cover engaged on a first member and a first extending member . 所述滑动机构包括第一旋转件、第一卡扣件、第二卡扣件以及第一弹性件。 The slide mechanism includes a first rotary member, a first locking component, a second locking component and the first elastic member. 所述第一旋转件的相对两端分别转动连接于第一部件与第二部件上。 The opposite ends of the first rotary member are rotatably connected to the first member and the second member. 所述第一弹性件设置于第一旋转件与第一部件之间。 The first elastic member disposed between the first rotary member and the first member. 所述第一卡扣件与第二卡扣件分别设置于第一部件与第二部件上，且二者可在外力作用下卡合与分离。 The first locking component and the second locking component are disposed on the first member and the second member, and both may be engaged and separated by an external force. 当所述第一卡扣件与第二卡扣件相互卡合时，第一部件与第二部件相互扣合使所述第二部件处于第一状态并同时挤压第一旋转件使所述第一弹性件发生弹性形变。 When the first locking component and the second locking component is engaged with each other, the first member and the second member mutually engaging the second member in the first state and the first rotating member while pressing the the first elastic member elastically deformed. 当所述第一卡扣件与第二卡扣件相互分离时，所述第一弹性件恢复弹性形变产生弹力以驱动所述第一旋转件相对第一部件转动并推动第二部件相对于第一部件滑动使所述第二部件处于第二状态。 When the first locking component and the second locking component separated from each other, said first elastic member generating an elastic force to restore the elastic deformation of the first rotation drive member and rotates relative to the first member pushes the second member relative to the first a sliding member of the second member in the second state. 在使用上述滑动机构及带有该滑动机构的装置时，用户只需施加一个外力使第一卡扣件与第二卡扣件脱离卡扣，以解除第一部件与第二部件的锁定状态，压制于第一旋转件与第一部件之间的第一弹性件释放能量并驱动第一旋转件转动，且同时推动第二部件相对第一部件滑开。  When using the sliding mechanism and the sliding mechanism apparatus with, the user simply applying external force to a first locking component and the locking component from the second buckle to release the first member and the second member locked state, pressing the first rotating member and the first elastic member to release energy between the first drive member and first rotating member and simultaneously pushes the second slide member relative to the first member apart. 图1为装置一较佳实施方式的第一使用状态的立体图。  FIG. 1 is a perspective view of a first state of use of a preferred embodiment of the apparatus. 图2为图1所示的装置的立体分解图。  FIG. 2 is a perspective exploded view of the device shown in FIG. 图3为图1所示的装置一视角的立体分解图。  FIG. 3 is a perspective exploded perspective view of a device shown in FIG. 1. 图4为图3所示的装置另一视角的立体分解图。  FIG. 4 is an exploded perspective view of another apparatus shown in FIG. 3. 图5为图1所示的装置第二使用状态的立体图。  FIG. 5 is a perspective view of a second state of use of the device shown in FIG. 以下以一较佳实施例作为本发明的详细说明，本实施例仅用以作为范例说明，其中的图式亦省略不必要的组件，以清楚显示本发明的技术特点。  In the following only as an example to illustrate a preferred embodiment of the present invention as described in detail, the present embodiment, wherein FIG formula also unnecessary components are omitted in order to highlight the technical features of the invention. 请参阅图1，一较佳实施例中的装置100包括第一部件10、第二部件30以及连接于第一部件10与第二部件30之间的滑动机构50。  Referring to FIG 1, a preferred embodiment of the apparatus 100 includes a first member 10, second member 30 and the slide mechanism between the member 10 and the second 30 is connected to the first member 50. 第一部件10与第二部件30相对平行设置，且两者在滑动机构50的作用下能够在第一状态与第二状态之间切换。 The first member 10 and second member 30 are disposed in parallel opposed and both can be switched between a first state and a second state under the action of the slide mechanism 50. 其中，第一状态为第一部件10盖合于第二部件30上，第二状态为第一部件10伸出第二部件30外。 Wherein a first state of a first cover member 10 bonded to the second member 30, the second state to the first member 10 extending beyond the second member 30. 请一并参考图2、图3以及图4,第一部件10包括第一侧边11及与第一侧边11相对平行设置的第二侧边13。  Please refer to FIGS. 2, 3 and 4, a first member 10 and 13 includes a first side 11 and second side 11 opposite first side disposed in parallel. 第一部件10与第二部件30相对的一面向内凹陷形成有用于安装滑动机构50的收容槽15。 The first member 10 and the second side member 30 opposed inwardly recessed groove is formed with a receiving mechanism 50 for mounting the slide 15. 收容槽15自第一侧边11向第二侧边13方向延伸至第一部件10的中部。 Receiving groove 15 extends to the middle of the first member 10 in the direction toward the second side 13 from the first side edge 11. 收容槽15相对的两端形成有第一收容槽150与第二收容槽151。  The opposite ends of the receiving slot 15 is formed with a first receiving groove 150 and the second receiving groove 151. 其中，第一收容槽150设置于靠近第一侧边11的一端，第二收容槽151设置于靠近第二侧边13的一端。 Wherein, in the first receiving groove 150 is provided near one end of the first side 11, a second receiving groove 151 provided in the near end of the second side edge 13. 第二收容槽151大体呈T字形，其包括平行且靠近第一侧边11的第一凹槽1510及与第一凹槽1510垂直且连通的第二凹槽1511。 Receiving a second substantially T-shaped slot 151, comprising parallel and close the first groove 1510 and the first side 11 of the first recess and the vertical second recess 15111510 communication. 收容槽15的中部，即位于第一收容槽150和第二收容槽151之间的位置设置有两个轴套16、滑槽17、定位柱18以及转动连接部19。 Central  The receiving groove 15, i.e., at a position disposed between the first receiving groove 150 and the second receiving groove 151 has two bushings 16, the chute 17, the positioning posts 18 and the connecting portion 19 is rotated. 其中，轴套16靠近于第一收容槽150,转动连接部19靠近第二收容槽151，滑槽17位于轴套16与转动连接部19之间，定位柱18设置于滑槽17与转动连接部19之间。 Wherein the sleeve 16 close to the first receiving groove 150, rotation of the connecting portion 19 adjacent to the second receiving groove 151, the chute 16 and the sleeve 17 is positioned between the rotary connection unit 19, disposed in the positioning post 18 is rotatably connected with the chute 17 between 19. 两个轴套16同轴且间隔设置于靠近第一收容槽150的一侧，且两者轴线与第一侧边11平行。  The two bushings 16 disposed coaxially and spaced in the side close to the first receiving groove 150, and both side edge 11 is parallel to the first axis. 两个轴套16均包括本体161、盖体162以及转轴163。 Two bushings 16 each include a body 161, a cover member 162 and the shaft 163. 本体161大体为长方形，其中部开设有半圆形的凹槽1610。 A generally rectangular body 161 which defines a semicircular recess portion 1610. 本体161与第一侧边11平行的两侧分别设置有凸柱1611与固定板1612。 Both sides of the body 161 and parallel to the first side 11 are provided with boss 1611 and the fixing plate 1612. 盖体162大致为半圆筒状，其相对的两侧分别设置有定位部1621及插入部1622。 Lid 162 is substantially semi-cylindrical, has opposite sides thereof is inserted into the positioning portions 1621 and 1622 are provided. 定位部1621与凸柱1611对应，并通过第一锁固件153固定于凸柱1611上。 1621 corresponding to the positioning portion and the boss 1611, and the first locking member 153 is fixed to the boss 1611. 插入部1622与固定板1612对应，其可在外力作用下插设于固定板1612上。 Insertion portion 1622 corresponding to the fixing plate 1612, which can be inserted in the external force on the fixing plate 1612. 转轴163包括第一轴部1630及第二轴部1631。 Shaft 163 includes a first shaft portion 1630 and the second shaft portion 1631. 第一轴部1630的形状与凹槽1610的形状相匹配，其收容于本体161与盖体162之间并能在外力作用下相对于凹槽1610转动。 The shape of the shape of the recess 1630 of the first shaft portion 1610 matches that received in the main body 161 and rotatable with respect to the cover 1610 between the recess 162 in the lower phase external force. 第二轴部1631则突出于轴套16外。 The second shaft portion 1631 protruding to the outer sleeve 16. 当转轴163在凹槽1610内转动时，转轴163可与轴套16的凹槽1610的内壁产生摩擦力以控制转轴163转动的速度，从而控制第二部件30相对于第一部件10的滑动速度。 When the shaft 163 rotates within the recess 1610, the shaft 163 can generate a frictional force with the inner wall of the sleeve 16 of the recess 1610 to control the rotational speed of the rotary shaft 163, thereby controlling the second member 30 with respect to the speed of the first sliding member 10 . 滑槽17与第一侧边11平行。  17 and the chute 11 parallel to the first side. 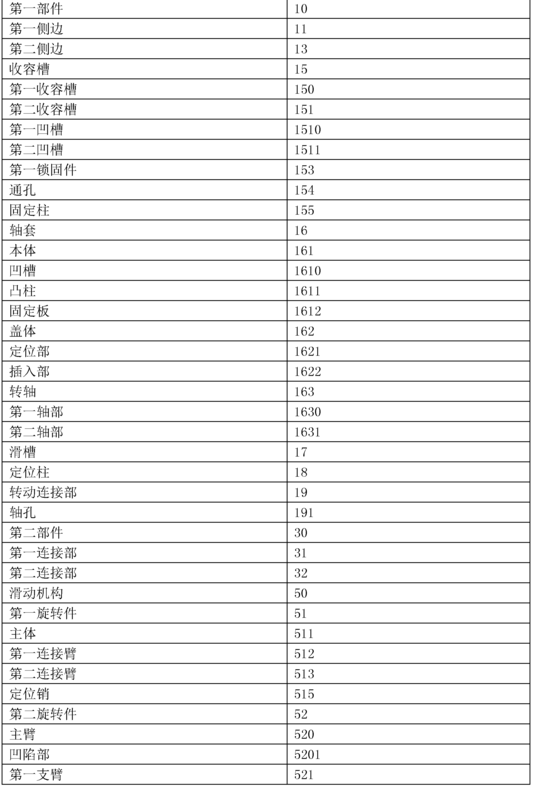 收容槽15与滑槽17两端相对应的侧壁上开设有通孔154,通孔154与滑槽17连通。 154 defines a through hole 154 communicating with the through holes 17 slide on the side wall of the receiving groove 15 corresponding to both ends of the chute 17. 滑槽17两端的端末与通孔154之间分别设置有固定柱155,且固定柱155与滑槽17位于同一条直线上。 Are provided between the ends of the terminal ends of the chute 17 and the through hole 154 has a fixed post 155, and fixing columns 155 and the chute 17 located on the same line. 定位柱18为凸设于第一部件10底面的凸柱。  The convex positioning post 18 provided on the bottom surface of the studs 10 of the first member. 两个转动连接部19相对设置，其上分别设置有轴孔191。 Two connecting portions 19 rotatably disposed opposite respectively provided with a shaft hole 191 thereon. 两个轴孔191同轴设置。 Two shaft holes 191 coaxially disposed. 第二部件30与第一部件10相对的一面包括两个间隔设置的第一连接部31及两个间隔设置的第二连接部32。  The second member 10 opposite member 30 and the first side portion includes a first connector 31 and two spaced second connecting portion 32, two spaced. 两个第一连接部31所在的直线与两个第二连接部32所在的直线平行，且两条直线之间保持一定间距。 Where the straight line and the second connecting portion 32 of the two first two connecting portions 31 located parallel to, and to maintain a certain distance between the two lines. 滑动机构50包括第一旋转件51、第二旋转件52、两个第一卡扣件53、两个第二卡扣件54以及第一弹性件55。  The slide mechanism 50 includes a first rotary member 51, a second rotary member 52, two first locking component 53, two second locking component 54 and the first elastic member 55. 第一旋转件51的一端转动连接于第二部件30的第一连接部31上， 另一端转动连接于第一部件10的转动连接部19上。 End of the first rotary member 51 is rotatably connected to the upper portion rotatably connected to the other end rotatably connected to the first member 10, second member 31 on the first connecting portion 30 of 19. 第二旋转件52的一端转动连接于第二部件30的第二连接部32上，另一端转动连接于转轴163的第二轴部1631上。 End of the second rotary member 52 is rotatably connected to the second member 32 of the second connecting portion 30, the other end of the second shaft rotatably connected to the shaft portion 163 of 1631. 第一^^扣件53穿过收容槽15的通孔154滑动连接于第一部件10上。 ^^ first fastener 53 through the through-hole 154 receiving groove 15 is slidably connected to the first member 10. 两个第二卡扣件54间隔设置于第二旋转件52上。 Two spaced second locking component 54 on the second rotary member 52. 第一弹性件55设置于第一部件10与第一旋转件51之间。 The first elastic member 55 disposed between the first member 10 and the first rotary member 51. 第一旋转件51包括主体511、第一连接臂512以及两个第二连接臂513。  The first rotary member 51 comprises a body 511, a first connecting arm 512 and two second connecting arms 513. 主体511呈长方形，第一连接臂512与第二连接臂513分别由主体511相对的两端分别向远离主体511方向延伸形成。 Rectangular body 511, a first connecting arm 512 and second arm 513 are connected by a main body 511 are formed at opposite ends 511 extending away from the body direction. 第一连接臂512通过一个定位销515与第二部件30上的第一连接部31转动连接。 A first connecting arm 512 is connected by a pin 31 on rotation of the first connecting portion 515 and the second member 30. 两个第二连接臂513对称设置，其位于两个转动连接部19之间。 Two symmetrically disposed second connecting arm 513, which is located between the two pivotal connecting portion 19. 第一弹性件55为扭簧，其设置于两个第二连接臂513之间。 The first elastic member 55 is a torsion spring, which is disposed between the two second connecting arms 513. 一个定位销515分别穿过转动连接部19的轴孔191、两个第二连接臂513以及第一弹性件55而转动连接于第一部件10上。 A positioning pin 515 extends through the rotary shaft hole 191 of the connecting portion 19, two second connecting arm 513 and a first elastic member 55 rotatably connected to the first member 10. 此时，第一弹性件55的一端抵接于第一部件10上，另一端抵接于第一旋转件51的主体511上。 In this case, a first end of the elastic member 55 abuts against the first member 10, and the other end abutting on the main body 511 of the first rotary member 51. 第二旋转件52包括主臂520、两个第一支臂521以及两个第二支臂522。  The second rotary member 52 comprises a main arm 520, two first arms 521 and the two second arms 522. 两个第一支臂521以及两个第二支臂522分别相对设置于主臂520的相反的两端。 Two first arms 521 and the two second arms 522 are respectively disposed opposite to the opposite ends of the main arm 520. 主臂520大体呈方形，其与第一部件10相对的一面上设置有凹陷部5201。  generally rectangular main arm 520, which has a concave portion 5201 of the first member 10 disposed on the opposite side. 两个第二卡扣件54相对间隔地设置于主臂520上，且与凹陷部5201设置于主臂520的同一面上。 Two spaced second locking component 54 disposed on the opposite main arm 520, and the recessed portion 5201 provided on the same surface 520 of the main arm. 第一支臂521与第二支臂522分别由主臂520相对的两端向远离主臂520方向延伸形成。 The first arm 521 and second arm 522 are respectively the opposite ends of the main arm 520 extends away from the main arm 520 is formed. 第一支臂521通过第二锁固件523与第二部件30的第二连接部32转动连接。 First arm 521 and second 523 second locking member 32 rotatably connected to the second connecting portion 30 through. 第二支臂522转动连接于转轴163的第二轴部1631上，从而使第二旋转件52与第一部件10转动连接。 Second shaft portion 1631 of the second arm 522 is rotatably connected to the shaft 163, so that the second member 52 and the first rotary member 10 is rotatably connected. 两个第一^^扣件53均包括操作部530、卡扣部532以及与操作部530连接的第二弹性件534。  ^^ two fastener 53 includes a first operating portion 530, locking portion 532 and a second elastic member 530 connected to the operation portion 534. 操作部530大体呈杆状，其包括两个相互垂直连接的第一侧面5301与第二侧面5302。 Substantially rod-like operating portion 530, which includes a first side 5301 connected to the two mutually perpendicular second side 5302. 卡扣部532设置于操作部530的一端，并由第一侧面5301向远离第二侧面5302的方向继续延伸形成。 Locking portion 532 provided at one end of the operation portion 530 by the first side surface 5301 continues to extend in a direction away from the second side surface is formed of 5302. 卡扣部532上开设有方形定位孔5321，以供第三锁固件535穿过。 It defines the locking portion 532 square positioning hole 5321, the third locking element 535 for passing through. 其中，定位孔5321的尺寸大于第三锁固件535的尺寸，以使第一卡扣件53可在外力作用下绕第三锁固件535移动。 Wherein the dimensions of the positioning holes 5321 is larger than the size of the third locking element 535 so that the first fastening element 53 is rotatable about a third locking element 535 moves by an external force. 两个卡扣部532相对一端的侧缘向远离卡扣部532方向垂直延伸形成条状的固定部5320。 Two opposite side edges of the locking portions 532 formed at one end of the strip-shaped fixing portion 5320 perpendicularly extending away from the direction 532 to the locking portion. 第二弹性件534为一弹簧，其收容于第一侧面5301与第二侧面5302之间。 The second elastic member 534 is a spring, which is accommodated between the first side to the second side surfaces 5302 and 5301. 第二弹性件534的一端连接于固定部5320上，另一端连接于第一部件10上，用以为第一卡扣件53提供回复力。 End of the second elastic member 534 is connected to the fixed portion 5320, and the other end connected to the first member 10, a first locking component 53 that provide a restoring force. 在组装时，将操作部530的一端穿过开设于收容槽15侧壁上的通孔154而外露于第一部件10外，并使操作部530的第二侧面5302的一侧边滑动连接于滑槽17内。  When assembled, the end of the operation portion 530 passes through the through hole 154 opened in the side wall 15 of the receiving groove 10 is exposed to the first outer member, and a second side surface of one side of the operation portion 530 5302 slidably connected to the chute 17. 将卡扣部532 与第一部件10上的定位柱18对应，第三锁固件535穿过定位孔5321将第一卡扣件53的相应端可移动地连接于第一部件10上，以使两个第一卡扣件53可在外力作用下沿相互靠近的方向移动。 18 corresponding to the locking portion 532 and the positioning posts 10 on the first member, the third locking hole 535 is positioned through the respective end 5321 of the first fastening element 53 is movably connected to the first member 10, so that two first locking component 53 is movable in a direction close to each other by an external force. 此时第一卡扣件53可在外力作用下沿滑槽17相对于第一部件10滑动，且其滑动的方向与第二部件30相对于第一部件10滑动的方向垂直。 At this time, the first locking component 53 in the external force along the chute 10 slide with respect to the first member 17, and the sliding direction of the second member 30 with respect to the direction perpendicular to the first sliding member 10. 请再参考图1，当第二部件30位于第一位置时，第二部件30叠合于第一部件10上， 第一旋转件51设置有第一弹性件55的一端压制于第二旋转件52的主臂520下，第一弹性件55压制于第二旋转件52下且处于储能状态（图未示）。  Referring again to FIG 1, when in the first position of the second member 30, second member 30 is stacked on the first member 10, the rotary member 51 is provided with a first end of the first elastic member 55 is pressed to the first the main arm 520 of the second rotary member 52, the first elastic pressing member 55 at a second rotary member 52 and in the storage state (not shown). 第一旋转件51的第一连接臂512收容于第二凹槽1511内，第二连接臂513收容于第一凹槽1510内。 A first rotary member 512 of the first connecting arm 51 received in the second recess 1511, the second connecting arm 513 is received in the first recess 1510. 第二旋转件52的第二卡扣件54 分别卡合于两个第-^扣件53的卡扣部532相背离的一端上，第二旋转件52的第一支臂521 收容于第二收容槽151的第一凹槽1510内。 A second rotary member 54 are engaged with the second locking component 52 is bonded to the first two - ^ locking portion 532 on the end facing away from the fastener 53, the first arm 521 of the second rotary member 52 is received in the second the receiving groove 151 of the first recess 1510. 第二弹性件534位于第一部件10与第一卡扣件53 之间，处于非拉伸状态。 The second resilient member 534 positioned between a first member 10 and the first locking component 53, in a non-stretched state. 请一并参考图5,当需要将第二部件30相对于第一部件10从第一位置滑动至第二位置时，用户对两个第一卡扣件53施加一个相对的推力，使两个第一卡扣件53沿滑槽17向相互靠近的方向移动。  Please refer to FIG. 5, when the second member 30 needs to be relative to the first member 10 is slid to the second position, the user applies to the two first locking component 53 from a first position relative to a thrust, the two first locking component 17 is moved along the slide groove 53 in a direction close to each other. 此时，第二卡扣件54与第一卡扣件53的卡扣部532脱离卡合，第一旋转件51的一端不再受第二旋转件52的压制作用，第一弹性件55释放能量并将第一旋转件51 慢慢顶起，第一卡扣件53在第二弹性件534的作用下复位。 At this time, the second locking component 54 and the first engaging portion 532 to disengage from locking catch 53, one end of a first rotary member 51 is no longer suppressed by the action of the second rotating member 52, first elastic member 55 is released and the energy of the first rotating member 51 gradually pushed up, the first locking component 53 is reset under the action of the second elastic member 534. 由于第一旋转件51与第二旋转件52的两端相互平行地分别转动连接于第一部件10与第二部件30上，因此当第一弹性件55释放能量将第一旋转件51慢慢顶起时，第二旋转件52与第一旋转件51将第二部件30相对于第一部件10由第二侧边13向第一侧边11方向慢慢推开。 Since the ends of the first rotary member 51 and the second rotary member 52 are parallel to each other are rotatably connected to the first member 10 and the second member 30, so that when the first elastic member 55 releases energy slowly the first rotating member 51 when the top, the second rotary member 52 and the first rotary member 51 of the second member 30 relative to the first member 1013 by a slowly pushed toward the second side edge 11 of the first side direction. 当第一弹性件55完全展开时，第一旋转件51与第二旋转件52分别绕转轴163与定位销515旋转180度。 When the first resilient member 55 fully expanded, the first rotating member 51 and the second rotary member 52 are rotated 180 degrees about the rotary shaft 163 and the positioning pin 515. 此时，第二旋转件52收容于收容于第一收容槽150内，第一旋转件51的第一连接臂512收容于第二旋转件52的主臂520 上的凹陷部5201内，第二部件30位于第二位置。 At this time, the second rotary member 52 is received in the receiving slot 150 received in the first, a first arm 512 connected to a first rotary member 51 is received in the recess portion 5201 on the main arm 520 of the second rotary member 52, a second member 30 is in the second position. 当需要将第二部件30相对于第一部件10从第二位置恢复至第一位置时，用户对第二部件30施加一远离第一部件10的拉力，并顺着第一侧边11向第二侧边13的方向将第二部件30滑动，第一弹性件55在第一旋转件51的作用下被压缩并储存能量。  When it is desired to second member 30 relative to the first member 10 is restored from the second position to the first position, the user applies a pulling force away from the first member 10, second member 30, along a first side edge and 11 of the second member 30 is slid toward the second side edge 13, a first elastic member 55 is compressed and energy is stored in the action of the first rotary member 51. 当第二部件30位于第一位置时，向下按压第二部件30,使第二旋转件52上的第二卡扣件54卡合于卡扣部532 上。 When the second member 30 in the first position, the second member 30 is pressed down, the second locking component 54 on the card 52 of the second rotary member 532 engaged to the locking portion. 此时第二部件30与第一部件10锁合于第一位置。 At this time, the second latch member 30 and the first member 10 bonded to the first position. 可以理解地，在其它一些实施例中第一卡扣件53与第二卡扣件54的其中一个设置于第一部件10上时，而另一个则可相对应地设置于第二部件30、第一旋转件51、第二旋转件52三者之中的一个上，以使两者能相互扣合与分离，从而实现第二部件30相对于第一部件10锁合与滑开。 When  It will be appreciated, in other embodiments, the first locking component 53 and the second locking component 54 which is provided on a first member 10, and the other may be provided corresponding to the second member 30, a first rotary member 51, one among the three second rotation member 52, so that the two can be separated from engagement with each other, thereby achieving the second member 30 relative to the first locking member 10 and slid . 本技术领域的普通技术人员应当认识到，以上的实施方式仅是用来说明本发明， 而并非用作为对本发明的限定，只要在本发明的实质精神范围之内，对以上实施例所作的适当改变和变化都落在本发明要求保护的范围之内。  skilled in the art should appreciate that the above embodiments are only used to illustrate the present invention and are not used as a limitation of the present invention, as long as within the true spirit of the invention, the above embodiments within the appropriate changes are made and variations fall within the scope of the invention as claimed. 1. 一种滑动机构，用于连接第一部件与第二部件使所述第二部件可在盖合于第一部件上的第一状态及伸出第一部件的第二状态之间切换，其特征在于:所述滑动机构包括第一旋转件、第一卡扣件、第二卡扣件以及第一弹性件;所述第一旋转件的相对两端分别转动连接于第一部件与第二部件上;所述第一弹性件设置于第一旋转件与第一部件之间；所述第一卡扣件与第二卡扣件分别设置于第一部件与第二部件上，且二者可在外力作用下卡合与分离；当所述第一卡扣件与第二卡扣件相互卡合时，第一部件与第二部件相互扣合使所述第二部件处于第一状态并同时挤压第一旋转件使所述第一弹性件发生弹性形变；当所述第一卡扣件与第二卡扣件相互分离时，所述第一弹性件恢复弹性形变产生弹力以驱动所述第一旋转件相对第一部件转动并推动第二部件相对于第一 1. A sliding mechanism for connecting a first member and a second member of the second member may be switched between the second state to the first state of the cover engaged on a first member and a first projecting member, characterized in that: said slide means comprises a first rotary member, a first locking component, a second locking component and the first elastic member; the opposite ends of the first rotary member are rotatably connected to the first member and the second the two member; the first elastic member disposed between the first rotary member and the first member; the first locking component and the second locking component are disposed on the first member and the second member, and the two may engage with the separation of an external force; locking component when the first and the second locking component is engaged with each other, the first member and the second member mutually engaging the second member in the first state a first pressing member while rotating the first elastic member is elastically deformed; locking component when the first and second locking components separated from each other, said first elastic member generating an elastic force to restore the elastic deformation of the drive a first member relative to the first rotation member is rotated and pushes the second member relative to the first 件滑动使所述第二部件处于第二状态;所述第一卡扣件包括外露于第二部件的操作部及与该操作部连接的扣合部，当施加外力按压第二部件时，所述扣合部与所述第二卡扣件卡合；当施加外力推动操作部时，所述操作部可带动扣合部向远离第二卡扣件方向移动以使第一扣合件与第二卡扣件分离;所述第一卡扣件滑动设置于第一部件上，所述第一卡扣件还包括第二弹性件，所述第二弹性件在推动操作部的外力撤销后为所述第一卡扣件提供回复力使所述第一卡扣件复位;所述操作部包括两个相互垂直连接的第一侧面与第二侧面，所述扣合部设置于操作部的一端， 并由所述第一侧面的一侧边向远离第二侧面方向延伸形成;所述扣合部上设置有固定部， 所述第二弹性件的一端固定于所述固定部上，另一端固定于所述第一部件上。 Sliding the second member is in a second state; includes the first engaging catch portion and the operation portion connected to the operation portion is exposed to the second member, when the pressing force is applied to the second member, the said engaging portion and the second engaging catch; when external force is applied to the operating unit, the operating unit can drive the engaging portion away from the second locking component so that the first direction and the second fastening member two separate grommet; the first locking component slidably disposed on the first member, the first locking component further includes a second resilient member, the second elastic member in driving force after the operating portion is revoked the first locking component provides a restoring force resetting the first locking component; said operating section comprises a first side and a second side surface connected to two mutually perpendicular, said engaging portion is provided at one end of the operation portion by the side of a first side surface extending away from a second lateral direction are formed; a fixing portion provided on the engaging portion, the end of the second elastic member is fixed to the fixing portion, the other end fixed to the first member. 2. 如权利要求1所述的滑动机构，其特征在于:所述第一卡扣件的移动方向与所述第二部件相对于第一部件滑动的方向垂直。 The sliding mechanism according to claim 1, wherein: said first fastener card moving direction of the second member relative to a direction perpendicular to the first sliding member. 3. 如权利要求1所述的滑动机构，其特征在于:滑动机构还包括第二旋转件，所述第二旋转件的相对两端分别转动连接于第一部件与第二部件上，当所述第一卡扣件与第二卡扣件相互分离时，所述第二部件带动所述第二旋转件相对第一部件转动;第一旋转件与第二旋转件的旋转方向相同，且二者在旋转的过程中保持平行。 3. The sliding mechanism according to claim 1, wherein: the sliding mechanism further includes a second rotating member, the opposite ends of the second rotating member are rotatably connected to the first member and the second member, when the when said first locking component and the second locking component from each other, said second rotating member drives the second member relative to the first rotary member; the same rotational direction of the first rotary member and the second rotary member, and the two who remain parallel during rotation. 4. 如权利要求1所述的滑动机构，其特征在于:滑动机构还包括第二旋转件，所述第二旋转件的相对两端分别转动连接于第一部件与第二部件上;所述第二旋转件部分叠合于所述第一旋转件上；当所述第一卡扣件与第二卡扣件相互分离时，所述第一旋转件可推动第二旋转件转动。 The sliding mechanism according to claim 1, wherein: the sliding mechanism further includes a second rotating member, the opposite ends of the second rotating member are rotatably connected to the first member and the second member; the the second rotary member is stacked on the upper portion of the first rotary member; locking component when the first and second locking components separated from each other, said first rotary member may push a second rotating member. 5. 如权利要求3或4所述的滑动机构，其特征在于:所述第一部件上设置有与第二旋转件转动连接的转轴及套设于转轴上的轴套;所述转轴在转动的过程中可与轴套之间产生摩擦力来控制转轴的转动速度，从而控制第二部件相对于第一部件的滑动速度。 The sliding mechanism as claimed in claim 3 or claim 4, wherein: said first member is provided with a rotatable shaft and the second rotary member connected to the sleeve and the sleeve is provided on the rotation shaft; rotation of said shaft the process can produce a frictional force between the sleeve and the shaft to control the rotational speed, to control the speed of the second member relative to the first slide member. 6. 如权利要求3或4所述的滑动机构，其特征在于:所述第二卡扣件设置于第二旋转件上。 3 or 4, the slide mechanism as claimed in claim 6., wherein: said second locking component arranged on the second rotary member. 7. -种带有一滑动机构的装置，其包括第一部件、第二部件及连接于第一部件与第二部件之间的滑动机构，其特征在于:所述滑动机构为权利要求1~4任何一项所述的滑动机构，使第二部件可在盖合于第一部件上的第一状态及伸出第一部件的第二状态之间切换。 7. - kind of means having a sliding mechanism comprising a first member, a second member and the connecting mechanism between the first sliding member and a second member, wherein: said sliding mechanism as claimed in claim 1 to 4 any one of the slide mechanism, the second member may be switched between the second state to the first state of the cover engaged on a first member and a first extending member.